Cut your cooking time for Mangalorean dishes substantially by making Kundapur masala powder ahead of time. This spice blend or masala is what goes into most vegetarian as well as non-vegetarian Mangalorean dishes. Welcome to the world of Mangalorean cuisine! 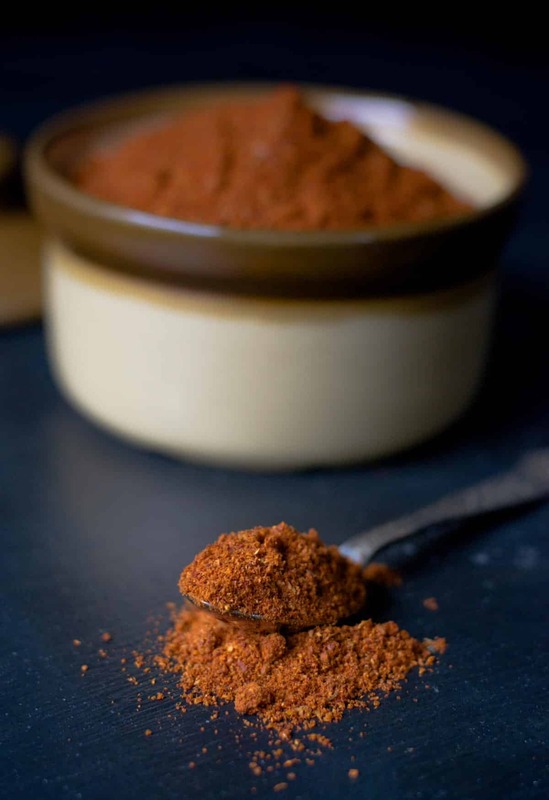 For those new to Mangalorean food, I will start with a quick 101, and you will soon know why Kundapur masala or Kundapur taal powder (alternate name) is so important to Mangalorean cooking. What exactly is Mangalorean cuisine? 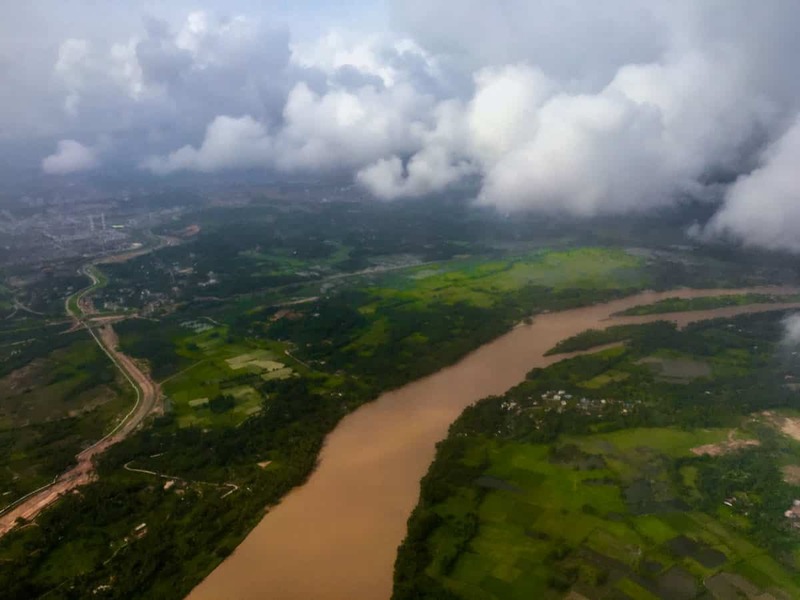 In the southern part of India, and in the state of Karnataka lies a beautiful coastal city called Mangalore lined by coconut trees and bounded by the Arabian Sea to its west and the Western Ghats to its east. Mangalore is a potpourri of people hailing from different ethnic communities such as Bunts, Mogaveeras, Billavas, Goud Saraswat Brahmins, Mangalorean Catholics, and the Bearys. The cuisine of these communities is collectively known as Mangalorean cuisine. 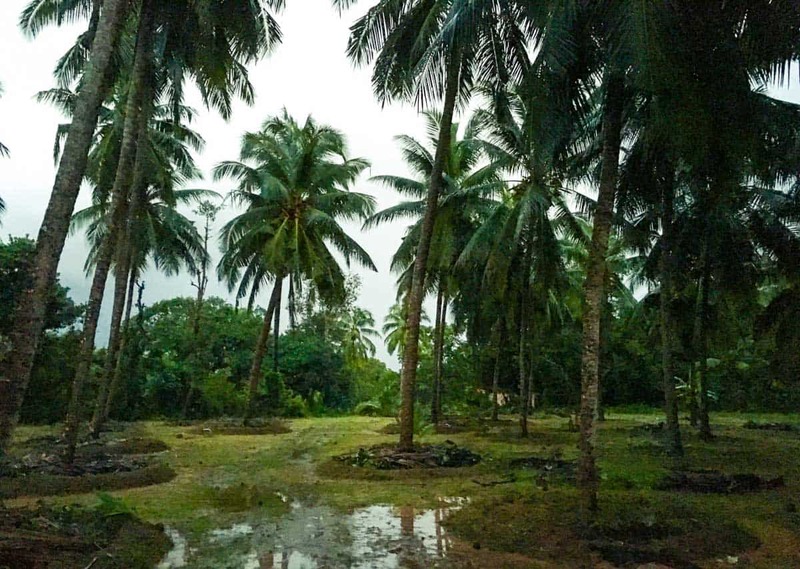 The backyard of my home in Kaup, Mangalore. While each community has its specialty dishes, this blog primarily focuses on the recipes from the Bunt community (which I hail from). Kori Rutti (chicken curry), Meen Gassi (fish curry), Neer Dosa (Rice crepes), Bareda kai ajadina (Raw plantain dish) are some of the popular dishes from the Bunt community. What’s common between all these dishes is the fact that they all use the same basic spices such as Byadgi chilies, coriander seeds, cumin seeds, black pepper seeds, and fenugreek (methi) seeds. 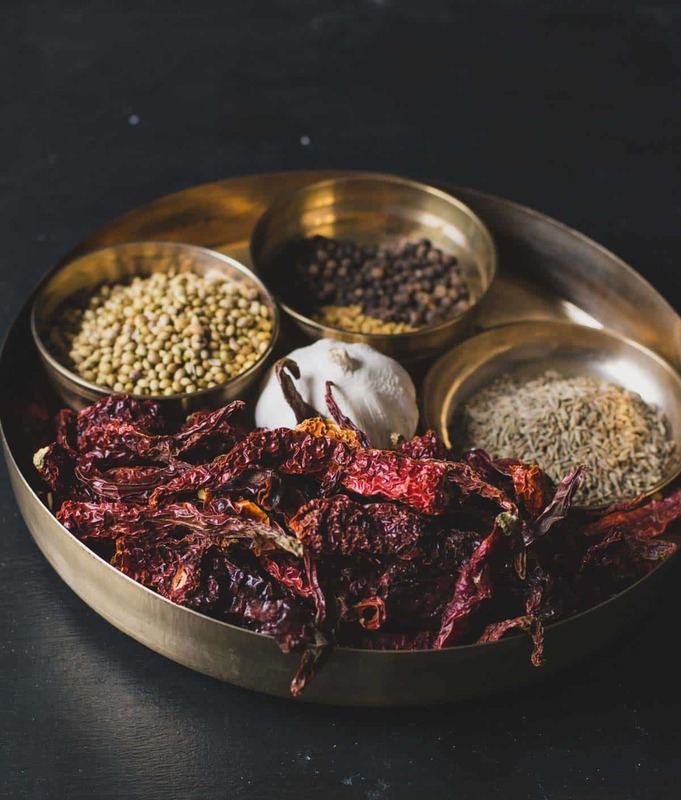 Mangalorean dishes can be time-consuming to make because these spices need to be roasted, allowed to cool down before being ground into a fine masala or paste along with other ingredients such as onions, tomatoes, garlic, etc. 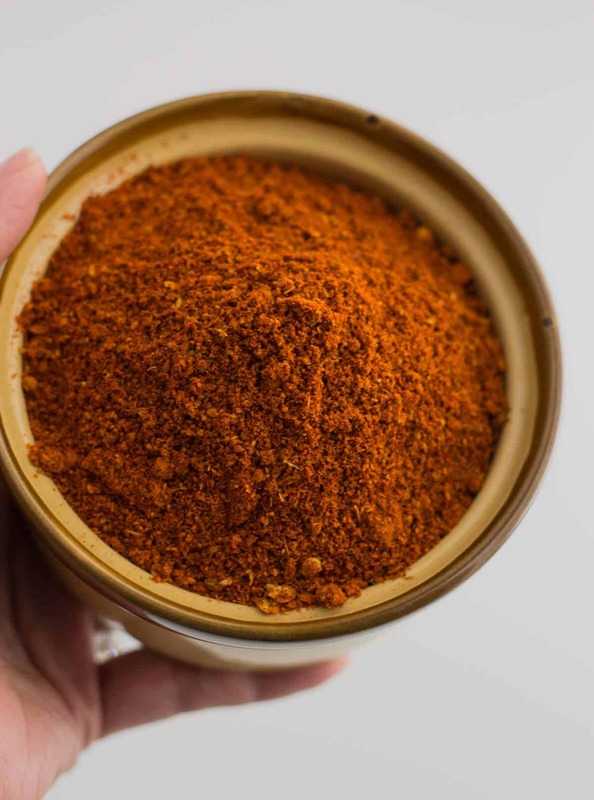 While my grandmom used to make this masala from scratch before every meal, busy, working women from my mother’s generation devised a way to make this spice blend ahead of time so that they could make Mangalorean food without spending as much time. That tradition continued with my generation as well. In fact, during my initial years of marriage, my mother-in-law and my mother would give me a good year’s worth of supply of homemade Kundapur masala every time I took a trip to India. After a few years, as I grew confident in my culinary skills, I started making my own. Why the name Kundapur Masala? Kundapur is a coastal town in Karnataka from where this recipe originated, hence the name. 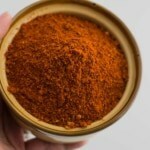 While this recipe originated from the bunts community, the Mangalorean Christian community also have their version of this masala, called as Bafat masala powder. Bafat masala and Kundapur taal masala are often used interchangeably. Note – This recipe uses dehydrated garlic cloves. Feel free to skip it and add garlic to this mix later when you are making your dish. To dehydrate garlic, roast the unpeeled garlic cloves in a pan on medium to low heat until crisp. Heat oil in a medium-sized pan and at medium heat. Add chilies to it and roast them till an aroma emanates from it. Remove the chilies and keep it aside. Transfer them to a blender along with the chilies and dehydrated garlic cloves and grind them to a fine powder. Store it in an airtight container for future use. Note: To dehydrate garlic, roast the unpeeled garlic cloves in a pan on medium to low heat until crisp. Before you go, follow me on Pinterest and pin this recipe to your board to make it in the future. I have had some amazing Gassi curries while on my work trips to Mangalore and also some ordered at home from some good restaurants in Mumbai run by Mangolarean Shettys. Hi Haren – Thanks for stopping by. Traditionally Mangaloreans cook with coconut oil, that’s what my grandmom used for all curries. And tamarind can be used as a substitute for jaargey. I’m komal from Mysore .. masala looks good but can u share how to make in little quantity .. to use it for one or two times? Hi, Komal – For one dish, this is the ratio I would use – 10 byadgi chilies,1 tablespoon coriander seeds, 1/2 teaspoon cumin seeds, 1/4 teaspoon methi seeds,7-8 pepper seeds. Let me know if you have any additional questions.